The LinkedIn background image is the first thing visitors see when they click on your profile, along with your personal photo. 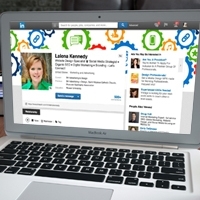 Images add instant branding, credibility and personality to your LinkedIn profile. The background photo appears above the top section of your profile, at the top of the page. You can't edit your background photo from a mobile device, but you can make changes from your desktop. Click the Camera icon above the top section of your profile. If your background image appears blurry or pixelated, choose an image with a file size as close to the maximum as possible, as images with larger file sizes typically look better. Even when you use the correct dimensions, you still have to consider the image and text itself. Remember: There is (technically) no draft version of your LinkedIn profile. So, as soon as you upload a custom image, have a few of your coworkers look at your Profile on their computers to see if any part of the image or text is being cut off. If you want to include text, include it in the top middle portion of your background image. Even then, double check that the text does not get cut off at the top. Photos will also look better than images with logos. If your image is still blurry or pixelated, you may want to run it through a compression tool before uploading it to LinkedIn. Keep your background image simple and uncluttered. The objective is to help others figure out who you are, what you offer and why they’ll want to work with you! p.s. While you’re on LinkedIn, send me a connection request. I’d love to be connected with you! Previous Post Previous: What’s on Your Website Wish List?